Description: Delicate ribbons made of various sizes of beads cascade around your neck, giving it the depth and beauty of an ocean wave. 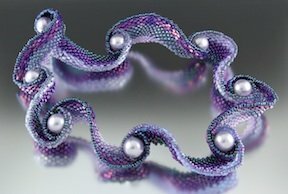 Finish the piece by adding beautiful Swarovski pearls to compliment the adjoined waves. Learn how to turn flat peyote stitch into a dimensional piece. Hide a magnetic clasp to give the necklace an “endless” look.